As I have mentioned, I’ve bought several things for the mountain house, but a few things didn’t make it out there. I bought 2 chairs and an ottoman that I was going to have redone and sent out to the mountains. CLICK HERE to see posts on the Mountain House. Well, that didn’t work out. I had the furniture, but didn’t get the fabric in time to put everything in the POD. So these chairs had to stay here. Since my old office chairs went to the farm, CLICK HERE, I decided these would be perfect to replace them. Here are the pieces I bought. I looked all over for fabric that I loved and settled on This is the fabric I bought. I bought 11 yards of this yummy buffalo check in blue. So what did I do that people don’t think you can do with fabric? I found two chairs and an ottoman that did not go together and had them redone in the same fabric. The chairs are different, but it doesn’t matter. They work together when they have the same fabric. See? This is one of my very favorite chairs. The other one does not have all of the carving work, but it’s very comfortable. Before I had chairs in front of the desk, but decided to move the new ones over by the window. I said I was going to add some color to my house, and I meant it. I am enjoying this new configuration, but the good news is that the chairs are lightweight and can easily be moved if I decide I don’t like them where they are. The downside to the color is that they will not work in just any room now. But that’s okay. I knew that going in. There are always positives and negatives to any decision, right? 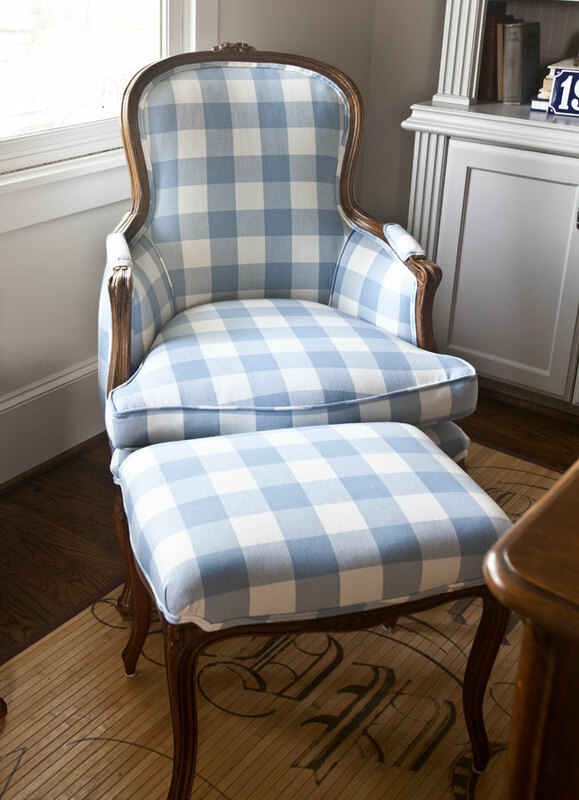 My friend who lived in France and married a French man said when she saw the chair fabric, “How very French!” Okay, sounds good to me. I love that the room feels so open. Moving the chairs helped, and also using chairs and a desk with legs helped to open up the room. I’ve made a few more changes in here I’ll share with you another day. 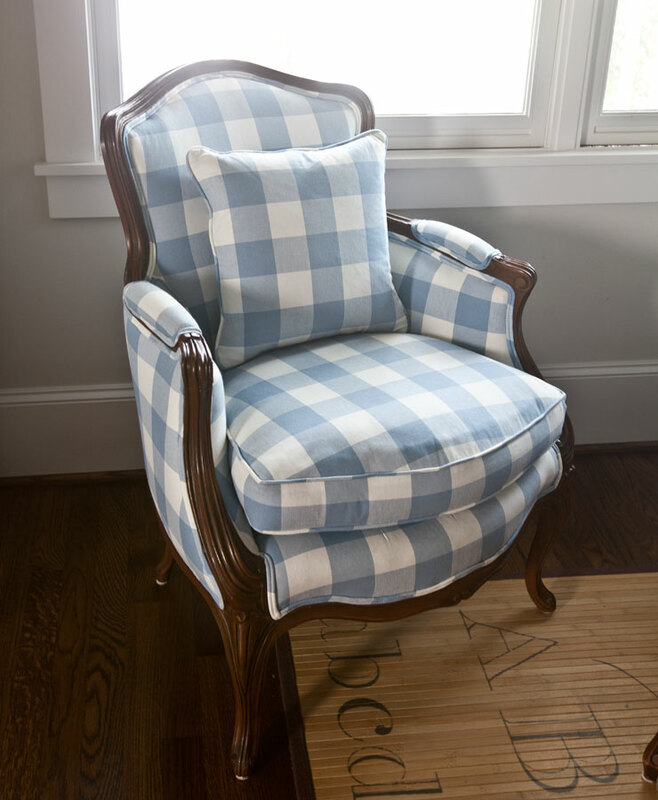 Using the same fabric on different chairs can make them look like a matched set. Using furniture with legs can make a room feel more open. Simple patterns, like the buffalo check, have a classic look. Greenery from the yard works great to give a room an upscale look for free. 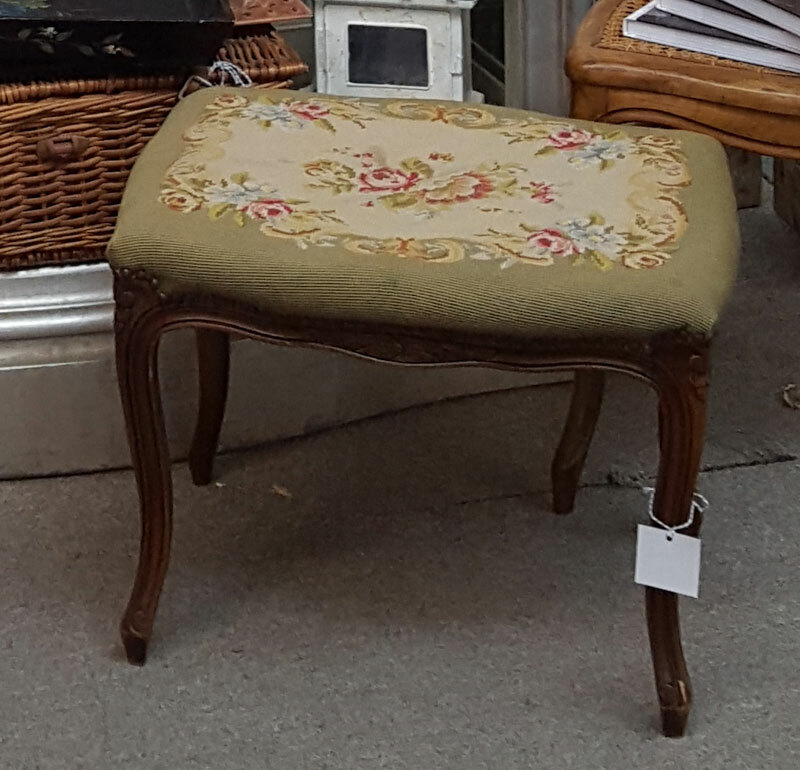 Beautiful Anita….I purchased the same fabric a few weeks ago and so far have had pillows made and moving on to recovering a chair with it….Love, love what you did!!! Love th blue buffalo fabric. 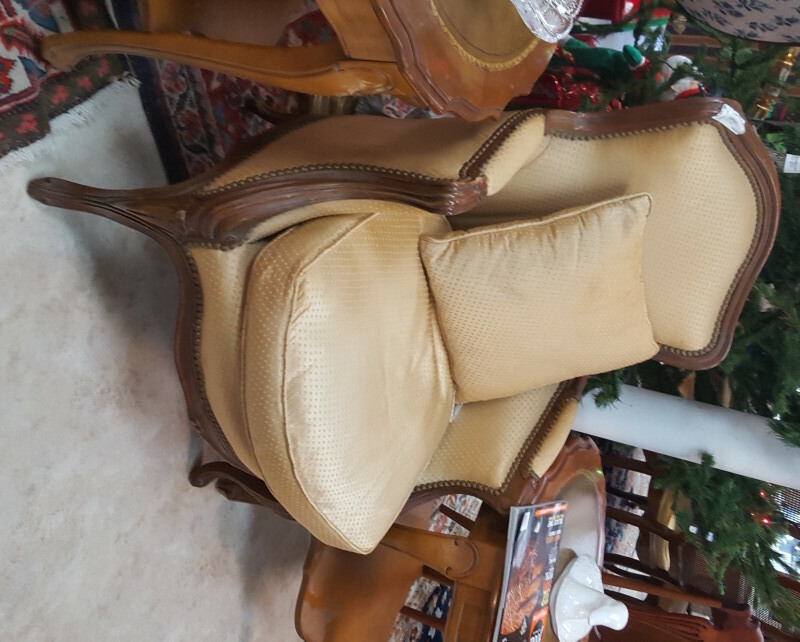 I would like to upostery a wing back chair, where can I get the fabric? Love the fabric on the chairs! I have some very similar but haven’t decided what to do with it, you may have inspired me! That is so awesome Wanda!!! I love the fabric you chose, Anita, and the addition of blue to your beautiful office. These chairs look so comfortable and look gorgeous with the new upholstery. I’m loving them! I first of all, love buffalo check in any color. Especially like it on the miss matched chairs. I like that look, same but different. Slowly getting through your “French Accents” savoring every page. Then going back to look again. Lovely! Can you give me any info on where I can find the rug? Thankyou. Susan, it is from Decor Steals. Thankyou Anita, for responding back! Question: Does your office chair roll smoothly over this mat? Again, Thankyou. Mostly yes, but the wheels have torn up the mat in one spot, so proceed with caution. Being such a busy lady, I truly appreciate your taking the time out to reply. Love the chairs and the fabric! Anita, I love the chairs. Who did the upholstery? Florence I have a great upholstery place near you that I love on Stuebner Airline called Neomy’s. It’s on Stuebner a little bit South of Mittlestadt. Beautiful as always! You have such a wonderful talent seeing the vision of these chairs. Having the right upholstery shop is the key, too. Do you use someone in the Heights area? I don’t have a source in the Heights Martha. I wish I did. I have it as curtIans with sheers in my bedroom. Love it. I bet they are gorgeous Linda. Love the rug under the desk. Would be perfect for my calligraphy work area. Do you know where it can be purchased? It was found at Decor Steals Marilyn. Love the fabric! I bought the same fabric in yellow and white and similar, but different style chairs, they are so cheerful in my living room, I think they’ll always be my favorite and so comfortable, thanks for the great ideas. Love the chairs–so clever to unite them with new fabric. With the help of your blog I am slowly but surely moving my house decor to French country. It is so much fun! Next step is painting dark dingy cabinets and new backsplash. Thank you for sharing all your great ideas bi ordered the Tristan slip covered chairs–waiting for them to be delivered. That’s awesome to see two different chairs covered in the same fabric and they work great together. I didn’t notice until close inspection they were different. That’s a great tip. I especially love these chairs and, of course, the desk. Buffalo check is one of my all time favorite go-to fabrics. 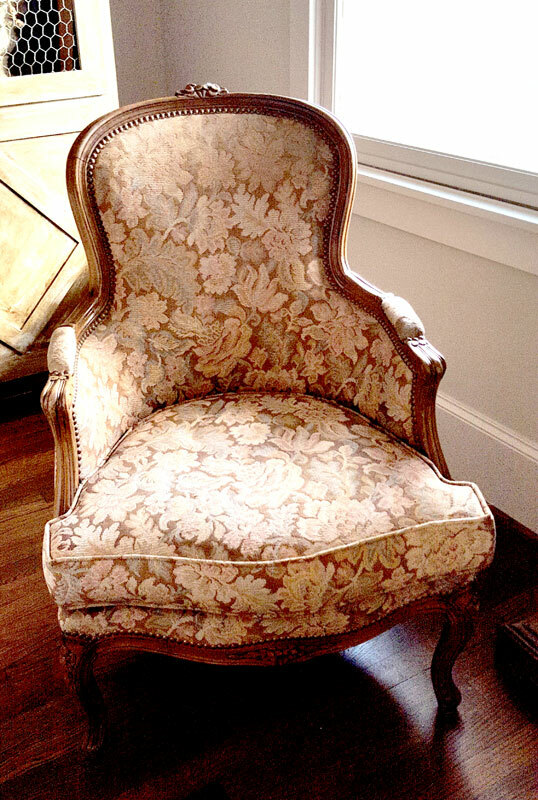 I’ve also used it on French style bergere chairs. I love that you stayed with leg furniture in a smaller room to give more visual space. Just before I retired, we scaled down from a large home and renovated a small farmhouse. I decorated using a mix of skirted and legged furniture to keep an open feel and it works very well. I’m loving my small house! Btw, are you by any chance a fan of Habersham’s Plantation Furniture? Oh I haven’t seen that collection. I guess I need to check it out Sharon! Love the chairs! Great job! So I will enjoy it vicariously through you! Absolutely love the French chairs. They bring such live and coziness to the room. Beautiful !!! Love the fabric and chairs. Great way too pull it together! the chairs are beautiful. But I love your rug?? Where did you find it? Your office looks so nice, yet functional. Absolutely love the chairs. What a Fantastic job done on the chairs! Can I ask where you got the floor rug from please?? The typography rug is from Decor Steals. The blue rug is from Ballard Designs. Love the bookcase, can you tell me where I can find it? My carpenter made it Donna. My husband and I just bought our first home. We are so excited to decorate it! I purchased some really cool, vintage chairs on Craig’s List and intend to reupholster using the same fabric you did. I love the look! Really curious how you think the fabric has held up. The reupholster employee said I might want to pick something more sturdy. But it seems fine to me. Any thoughts? Carli, it did seem to fade or wear in places, so it might not be the best for upholstery. Simple, classic, timeless! Totally did NOT notice the chairs didn’t match until you mentioned it. Loving the look Anita! Yay, that’s good news Janet. The room looks great and the chairs are beautiful. You can barely tell they don’t match. What I’m really wondering about is that rug? Can you give me information on it. I’m moving into s new condo in December. It’s bamboo and I found it at Décor Steals many years ago. Can you give me information on the rug? The alphabet rug? It was from Décor Steals.